1.Oxfords (also referred as “Balmorals”): the vamp has a V-shaped slit to which the laces are attached; also known as “closed lacing”. 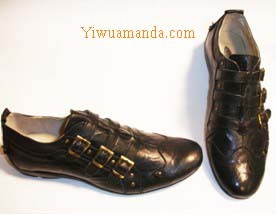 The word “Oxford” is sometimes used by American clothing companies to market shoes that are not Balmorals, such as Blüchers. 2.Blüchers (American), Derbys (British): the laces are tied to two pieces of leather independently attached to the vamp; also known as “open lacing” and is a step down in dressiness. 4.Slip-ons: There are no lacings or fastenings. The popular loafers are part of this category, as well as less popular styles, such as elastic-sided shoes. 1.Plain-toes: have a sleek appearance and no extra decorations on the vamp. 2.Cap-toes: has an extra layer of leather that “caps” the toe. This is possibly the most popular decoration. 3.Brogues (American: wing-tips): The toe of the shoe is covered with a perforated panel, the wing-tip, which extends down either side of the shoe. Brogues can be found in both balmoral and blucher styles, but are considered slightly less formal.